When you first take the camera out of its box, the monitor is positioned with the screen facing inward, protecting it from scratches and smudges, as shown on the left in this figure. It’s a good idea to place the monitor in this position when you’re not using the camera. 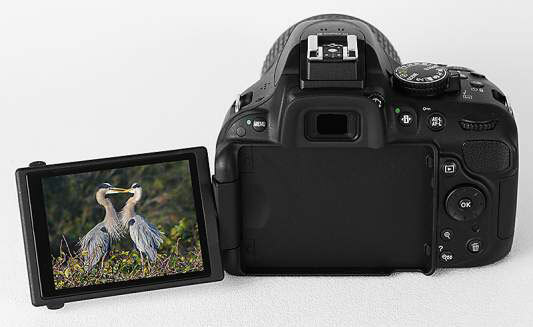 When you’re ready to start shooting or reviewing your photos, you can lock the monitor in the traditional position on the camera back, as shown on the right in the figure. Or, for more flexibility, you can swing the monitor out and away from the camera body and then rotate it to find the best viewing angle, as shown in this figure. Don’t force things. Although the monitor assembly is sturdy, treat it with respect as you adjust the screen position. The monitor twists only in certain directions, and it’s easy to forget which way it’s supposed to move. So if you feel resistance, don’t force things — you could break the monitor. Instead, rely on that feeling of resistance to remind you to turn the screen the other way. Watch the crunch factor. When positioning the monitor back into the camera (whether face in or face out), take care that nothing gets in the way. Use a lens brush or soft cloth to clean the monitor housing on the camera back so there’s nothing in the way that could damage the monitor. Clean smart. It’s virtually impossible to keep nose prints and fingerprints off the monitor. When you get the urge to clean the screen, use only the special cloths and cleaning solutions made for this purpose. (You can find them in any camera store.) Don’t use paper products, such as paper towels, because they can contain wood fibers that can scratch the LCD surface. One other housekeeping warning: Never use a can of compressed air to blow dust off the camera — the air is cold and can crack the monitor. Live View photography has some drawbacks. The Live View feature enables you to compose your photos using the monitor rather than the viewfinder. Live View may feel more comfortable than using the viewfinder if you’re stepping up to the D5200 from a point-and-shoot camera that didn’t have a viewfinder.